EFSP follows Le Gionate del Cinema Muto in Pordenone this week. One of the festival's programmes is Scandinavia, presenting two films starring Swedish actor Gösta Ekman: Thora van Deken/A Mother's Fight (John W. Brunius, 1920) and Vem dömer/Love's Crucible (Victor Sjöström, 1922). 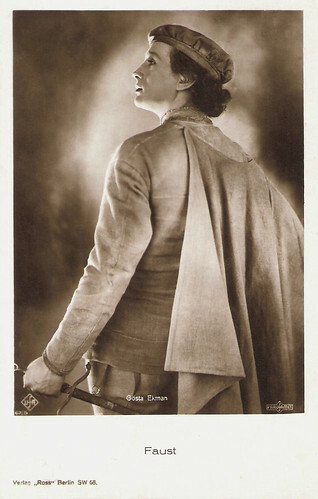 Ekman (1890-1938) was also the first real star of the Swedish theater. His boyish good looks attracted both sexes, helping to create a massive cult following, and elevating him to the status of a living legend. Combined with a beautiful voice, and a powerful stage and screen presence, Ekman was able to captivate his audiences. 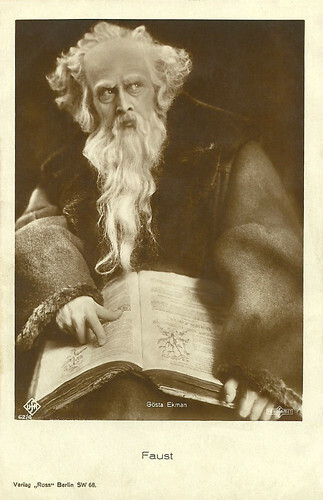 Swedish postcard by Verlag Nordisk Konst, Stockholm, no. 1095/9. Photo: Skandia Film. Publicity still for Thora van Deken/A Mother's Fight (John W. Brunius, 1920) with Oscar Johansson, Pauline Brunius, Gösta Ekman and Jessie Wessel. Swedish postcard by Axel Eliassons Konstförlag, Stockholm, no. 304. Photo: Skandia Film. 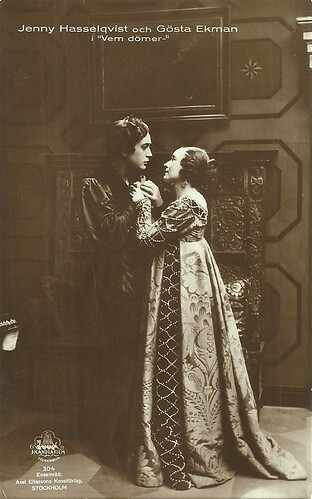 Gösta Ekman and Jenny Hasselquist in the Swedish silent drama Vem döme/rLove's Crucible (Victor Sjöström, 1922). German postcard by Ross Verlag, no. 62/5. Photo: Ufa. Publicity still for Faust (Friedrich Wilhelm Murnau, 1926). German postcard by Ross Verlag, no. 1623/1, 1927-1928. Photo: Nordisk. 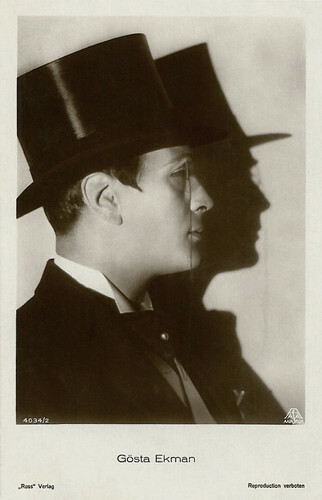 Publicity still for Klovnen/The Clown (A.W. Sandberg, 1926). German postcard. Ross Verlag No. 3746/2. Terra Film. 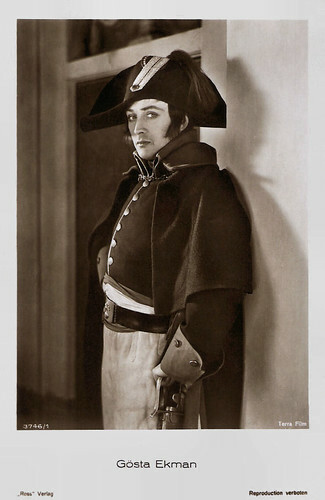 Gösta Ekman in the German silent film Revolutionshochzeit (A.W. Sandberg, 1928). Gösta Ekman was born as Frans Gösta Viktor Ekman in Stockholm in 1890. He first entered the stage as an extra in 1906, but made his professional stage debut in the renowned Selander Company in 1911. During his short life he enjoyed a prolific stage career, becoming a star of the Swedish theatre. 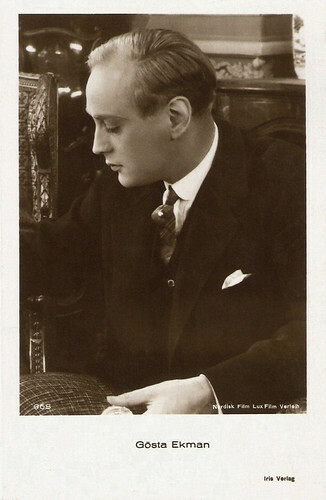 He won acclaim for his classic portrayals, such as Lionel in Friedrich Schiller’s Maid of Orleans (1914), Claudio in Much Ado About Nothing (1916), and Romeo in Romeo and Juliet (1919). Known as a self-taught master of disguise with theatre make-up and costumes, Gösta Ekman was equally convincing as a farmer's son, an 18th Century middle-aged aristocrat, or an 80-year old lunatic. Furthermore, he played in comedies, tragedies, dramas, and operettas. As a result, it was believed that he was capable of being convincing in all genres and as all types of characters. At different times, he also ran and supervised several private theatres in Stockholm, including the Oscarsteatern, the Vasateatern, and the Konserthusteatern. He was also head of the Gothenburg City Theatre in the 1930s. 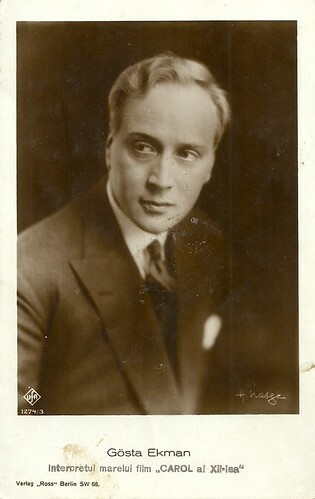 At the Vasateatern, which he ran from 1931 to 1935, he both directed and played the lead in several plays, while also producing a large number of productions. As a result, his time at the Vasateatern is considered to be the peak of his stage career. Swedish postcard by Axel Eliassons Konstförlag, Stockholm, no. 413, mailed in 1916. Photo: Uno Falkengren, Göteborg. Swedish postcard by Axel Eliassons Konstförlag, Stockholm, no. 21. Photo: Uno Falkengren, Nordiska Kompaniet, 1918. German postcard by Ross Verlag, no. 1274/5, 1927-1928. Photo: H. Natge / Ufa. Austrian postcard by Iris-Verlag, no. 5355. 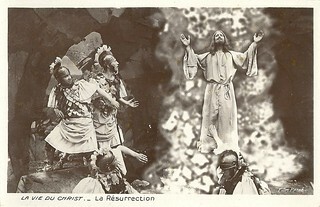 Photo: Pan-Film A.G.
German postcard by Ross Verlag, no. 4034/2, 1929-1930. Photo: Aafa Film. Gösta Ekman started to appear in films at the dawn of the Swedish film industry, and played an important role in its development. 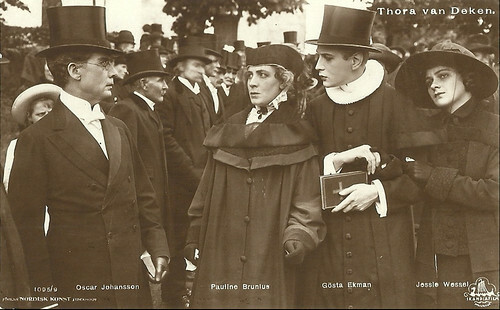 One of his first film roles was in Victor Sjöström's experimental film Trädgårdsmästaren/The Broken Springrose (Victor Sjöström, 1912). 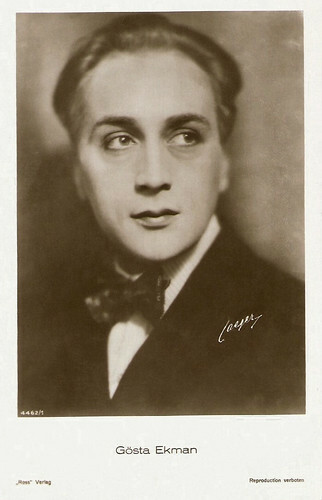 He also appeared in Den Okända/The Unknown Woman (Mauritz Stiller, 1913), Vem dömer/Love's Crucible (Victor Sjöström, 1922), and Karl XII/Charles XII (John W. Brunius, 1924-1925) made in two parts. Ekman also starred in Nordisk Studio's most lucrative release of the 1920s, Klovnen/The Clown (1926), directed and co-written by A.W. Sandberg. This was a remake of a 1917 film with the same title, also written and directed by Sandberg. Later, Gösta Ekman also played the lead in the first Swedish sound film, För hennes skull/For Her Sake (Paul Merzbach, 1930). Swedish postcard by Axel Eliassons Konstforlag, no. 305. Photo: Skandia Film. 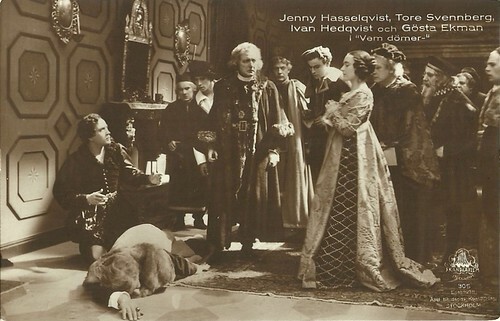 Jenny Hasselquist, Ivan Hedqvist, Tore Svennberg and Gösta Ekman in Vem dömer/Love's Crucible (Victor Sjöström, 1922). 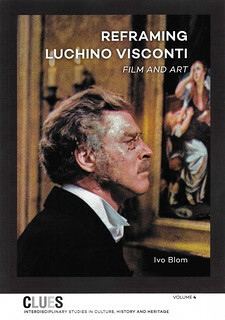 The film is a Renaissance drama where a young woman named Ursula (Hasselquist), who is in love with Bertram, the son (Ekman) of the mayor (Svenberg), is accused of having poisoned her older husband, the sculptor Master Anton (Hedqvist). She has to prove her virginity through a fire test. The film's title reads: Who judges? NB. Nils Asther had a small part in this film. He is man just left of Hasselquist. Romanian postcard. Photo: Monopol Gloria-Film. Gösta Ekman as the elder Swedish king Charles XII in the prestigious Swedish period piece Karl XII (John W. Brunius, 1925). 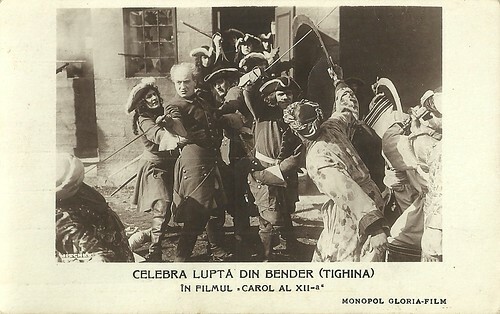 Caption: The famous fight at Bender aka Tighina [a city in Moldova] in the film Karl XII. Austrian postcard by Iris Verlag, no. 949. Photo: Nordisk Film / Lux Film Verleih. 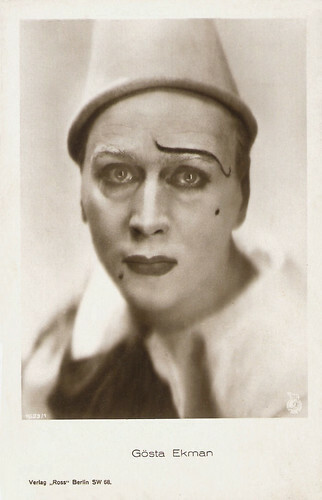 Publicity still for Klovnen/The Clown (A.W. Sandberg, 1926) with Karina Bell. Danish postcard by Alex. Vincent's Kunstforlag, Eneret, no. 253. Photo: publicity still for Revolutionshochzeit/Revolutionsbryllup/The Last Night (A.W. Sandberg, 1928) with Diomira Jacobini. German postcard by Ross Verlag, no. 3746/1, 1928-1929. 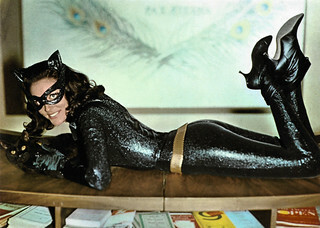 Photo: Terra Film. Publicity still for Revolutionshochzeit/Revolutionsbryllup/The Last Night (A.W. Sandberg, 1928). 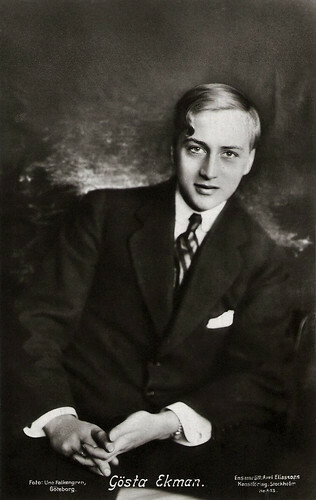 Gösta Ekman starred in two films that would gain international recognition. In F.W. Murnau's silent film classic Faust (Friedrich Wilhelm Murnau, 1926), he played the title character opposite Emil Jannings as Mephisto. And in the original version of Intermezzo (Gustaf Molander, 1936), where he played a world famous violinist opposite Ingrid Bergman in her breakout role. Ekman and Bergman had already acted opposite each other in Swedenhielms/Swedenhielms Family (Gustaf Molander, 1935). They share a couple of wonderful scenes together as their characters have a heart-to-heart conversation on life and love, which are among the most memorable moments in the film. His best on-screen credit is his double-role in the comedy Kungen kommer/The King Is Coming (Ragnar Hyltén-Cavallius, 1936), where Ekman masterfully plays first the king and then also the king's look-a-like; an actor who is hired by members of the Royal Court to impersonate His Majesty at a private party. Naturally the real king later arrives at the party causing a number of confusions and comic mix-ups. 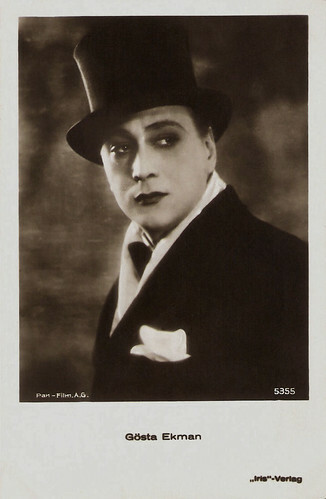 Ekman co-directed himself in the film En Perfekt gentleman/A Perfect Gentleman (Vilhelm Bryde, 1927), in which he also starred opposite exotic star La Jana. German postcard by Ross Verlag, no. 62/1. Photo: Parufamet. 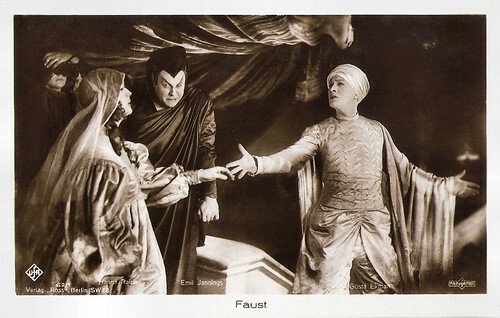 Publicity still for Faust (1926) with Hanna Ralph and Emil Jannings. German postcard by Ross Verlag, no. 62/3. Photo: Parufamet. 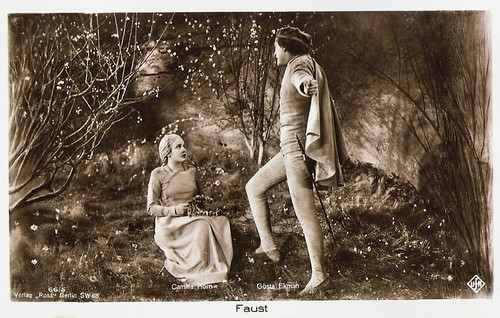 Publicity still for Faust (1926) with Camilla Horn. German postcard by Ross Verlag, no. 62/6. Photo: ParUfaMet / Ufa. 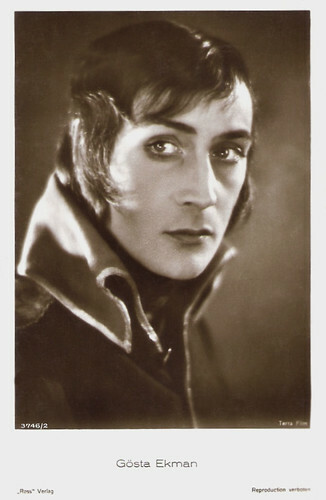 Gösta Ekman in Faust (1926). Collection: Didier Hanson. German postcard by Ross Verlag, no. 66/5. Photo: Ufa. Publicity still for Faust (1926) with Camilla Horn. German postcard by Ross Verlag, no. 66/6. Photo: Ufa. 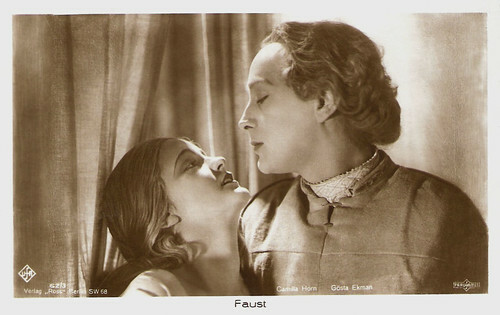 Publicity still for Faust (1926) with Camilla Horn. Early on, Gösta Ekman was labelled as a workaholic, sacrificing himself for his art and for his love of the theatre. Later, as his fame increased, his workload increased likewise. During the day, he would rehearse and direct plays. In the evening, he played leading roles in stage plays. Later at night, he would film. This busy schedule left him with relatively little free time. Furthermore, the free time he did have was spent carrying out his duties as the administrative director of the theatres he ran. 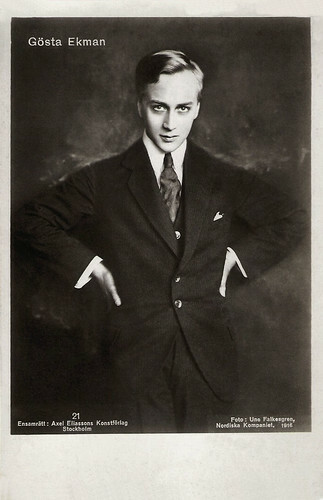 In 1926, while filming Faust in Berlin, he was introduced to cocaine by two Scandinavians, who told him that the drug would help him to cope better with his work schedule. Sadly, this began a long-term drug addiction that slowly deteriorated his health and eventually caused his death 12 years later at the age of 47. In 1914, Gösta Ekman had married Greta Sundström. Their son Hasse Ekman became one of Sweden's most successful film directors in the 1940s and early 1950s. 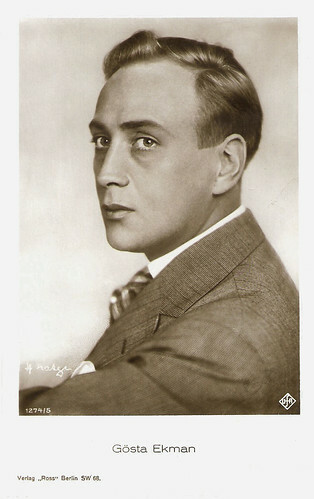 Gösta Ekman's grandson, Gösta Ekman jr., was one of Sweden's finest actors. He passed away in April this year. German postcard by Ross Verlag, no. 4462/1, 1929-1930. Photo: Jaeger (?). Austrian postcard by Iris Verlag, no. 968. Photo: Nordisk Film / Lux Film Verleih. DVD trailer for Faust (1926). Source: Kino International (YouTube). Scene from Klovnen/The Clown (1926). Source: Vintagezelle (YouTube). Sources: Wikipedia, Encyclopaedia Britannica, and IMDb. It's true, very handsome fellow. Great postcard, thanks for sharing. Your entire collection is incredible, and the information is very interesting. Thanks! Happy PFF. Great information it very useful an informative. You made some good points there. Thanks for sharing your knowledge.